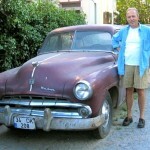 The inspiration for feralcars.com came after noting just how many Ford Falcons have survived over the past six decades. “Feral Falcons” posts on Facebook morphed into this site so our roots, it could be said, lie with Ford’s compact car. 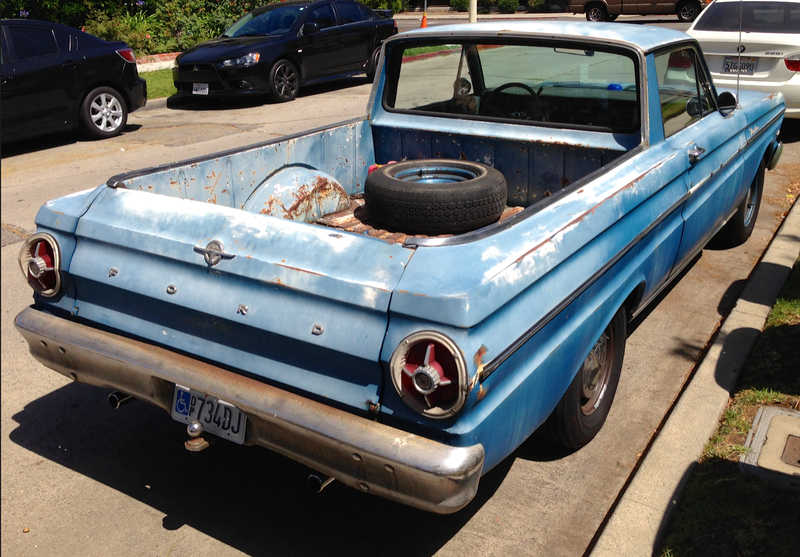 Many of those still-flying Falcons are Rancheros, the trucklette created by transforming the station wagon variant into a small pickup. The Rancheros car/truck concept debuted in 1957 and continued through ’59, based on full-size Fords and those, in turn, inspired Chevy’s El Camino. 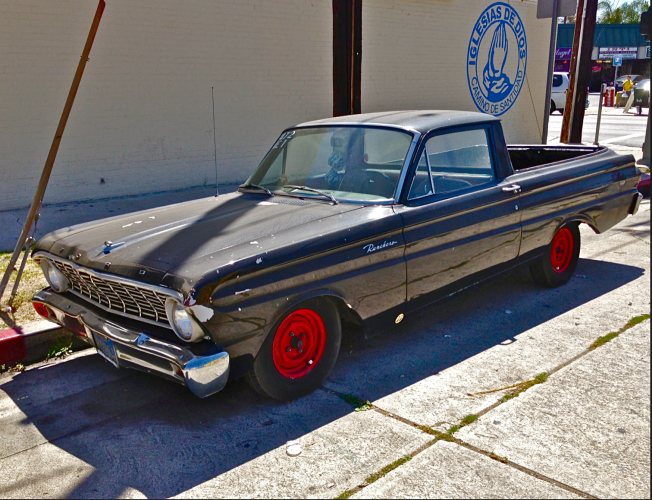 The Falcon-based Ranchero, however, truly ignited the mini truck revolution in which Toyota and Datsun would soon play their part. We thought we’d celebrate Labor Day by offering a gallery of Falcon Rancheros, all caught in the wild. While many are still hard at work, hauling whatever piles of detritus one may choose to toss in the load bed, we’re giving them the day off in recognition of their travails for the last 50+ years. 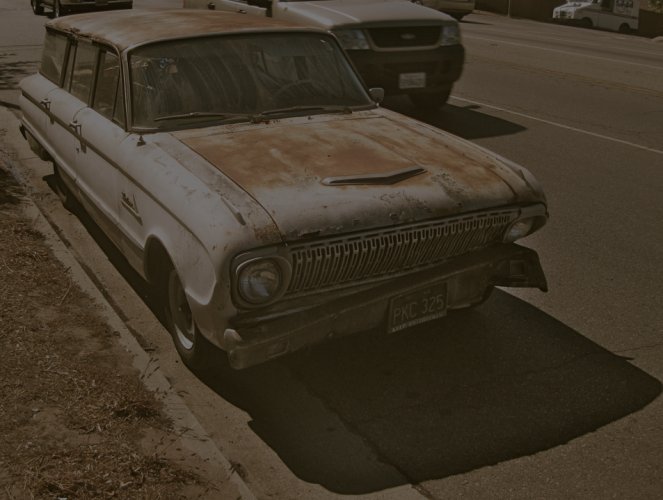 Ranchero was an integral part of the Falcon line through 1965 and a disproportionate number are still in service. We’re partial to the raw, un-restored, examples found in a condition that seems to underscore plebian roots. Let’s salute them on this day of the worker! 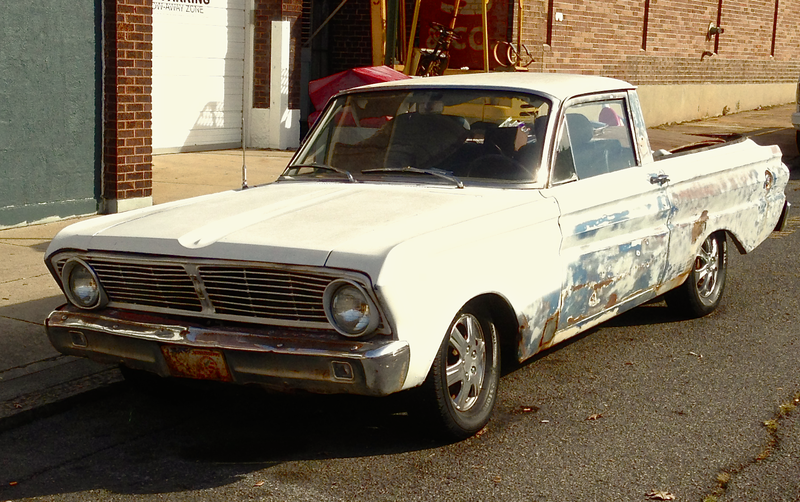 After 1965 Ranchero was based on the larger Fairlane platform and, ultimately, forswore its working class origin, transforming into a muscle car that happened to have a load bed. Fairlane yielded to Torino and this less-than-demure ’72 Ranchero GT with a bitchin’ hood scoop is a prime example of that change in attitude. 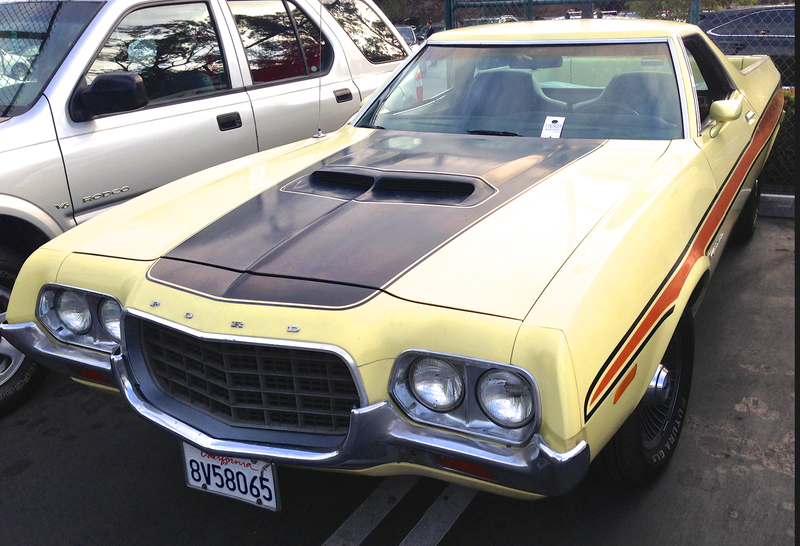 Here’s a Starsky & Hutch era ’78 Ranchero that shares its platform with the LTD II/Thunderbird of the time. 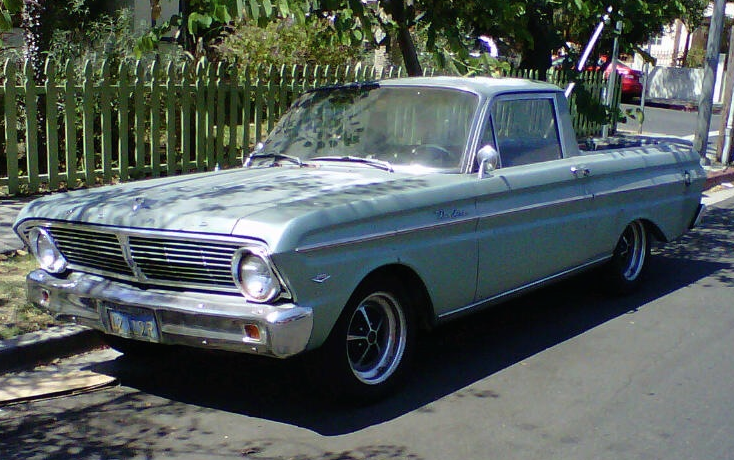 Aside from the fact that it’s a Ford built car based truck, its arriviste affect really has very little in common with that of the humble Falcon Ranchero that we celebrate today. 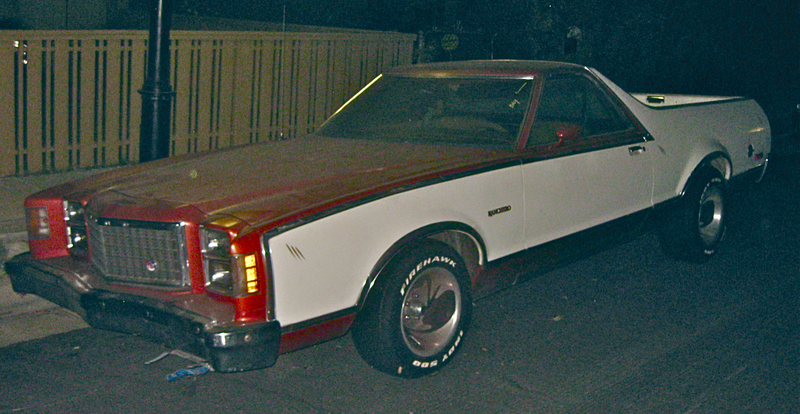 The basic Falcon Ranchero concept was revived by Volkwagen in the late ’70s with the Rabbit Pickup, built in Westmoreland, PA over a four year production run. We encountered this diesel powered 1980 example in rural Kelseyville CA the other day and its owner reports that he’s had 22 of these over the course of time. 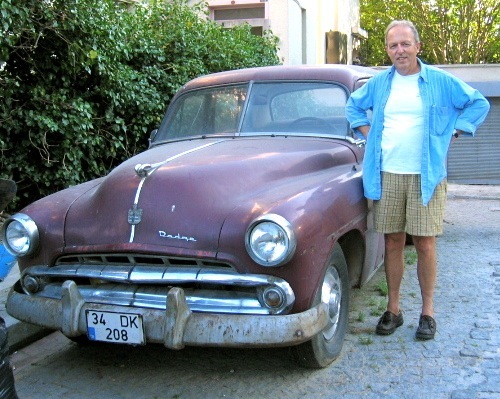 The motor on this one has been swapped out for a relatively recent TDi diesel and yields mpg in the mid 40s. How’s that for addressing the concerns of the working person? 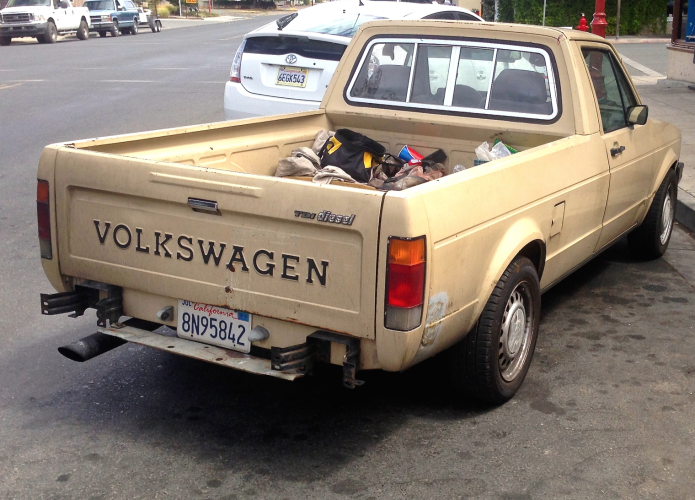 This entry was posted in Fairlane, Falcon, Ford, Ranchero, Rattles + Squeaks, Uncategorized, Volkswagen Rabbit on 08/31/2014 by feralcars. Rolls Royce has models called Ghost and Wraith but the only thing scary about those is the price. 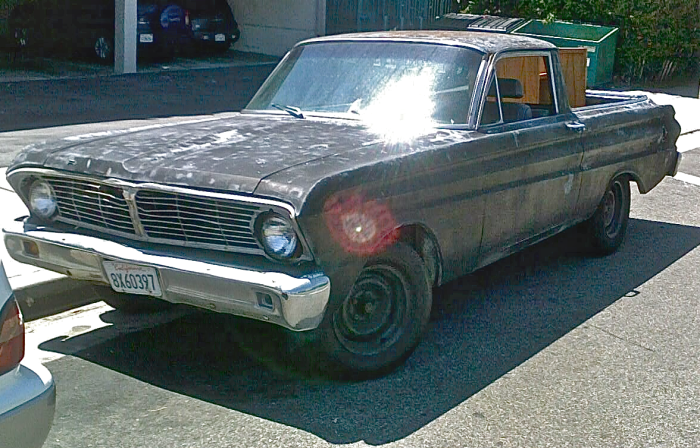 This ’64 Ford Fairlane 500, on the other hand, seems haunted on the eve of its 49th Halloween. Another Fairlane 500, of the very same vintage, submitted by FeralCars’ field scout extraordinaire Paul Diamon, does double duty as a holiday lawn ornament. You want really scary, you want really creepy? We suggest you cast an evil eye on this product of the Ford family. It’s a ’62 Falcon wagon that gives us the shivers. We found a video tour of a more recent Crown Victoria done up “Donk style” as a tribute to Casper the Friendly Ghost. We don’t make this stuff up; check it out for yourself right here. 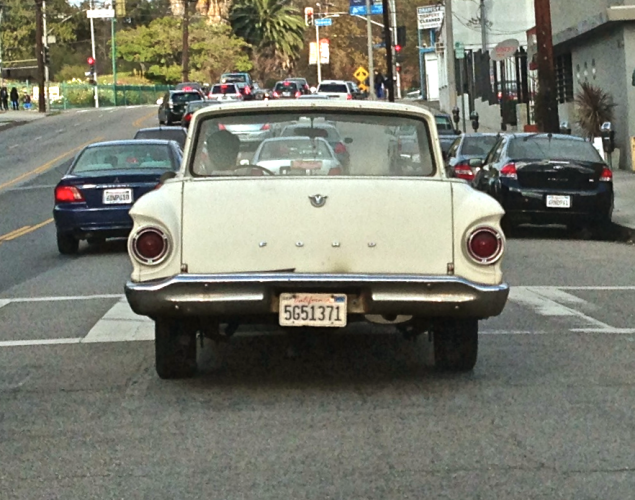 This entry was posted in Fairlane, Falcon, Ford and tagged Crown Victoria on 10/31/2013 by feralcars.